Donald Trump’s illegitimate Acting Attorney General Matt Whitaker had a few potentially conflicting goals today during his nationally televised testimony in front of the House Judiciary Committee. First, he had to keep Donald Trump happy. Second, he had to avoid looking stupid while answering tough questions from committee members. Third, he had to avoid committing perjury. 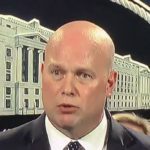 Time will tell if Trump ends up being pleased with Matt Whitaker’s smart-alecky yet bumbling performance today. Whitaker has certainly looked terrible in the eyes of the general public. But the lasting question here is the one of whether he committed perjury. We all know Robert Mueller is tuning in today, to see if Whitaker’s sworn answers match up with the facts and evidence that Mueller is sitting on – and that’s where Whitaker may be in serious legal trouble, based on at least one answer he gave. Committee Chairman Jerry Nadler asked Whitaker if he discussed the Mueller investigation with Donald Trump, and he responded by citing executive privilege. Nothing works that way, as Trump himself isn’t known to have formally invoked executive privilege on this matter, and Whitaker can’t invoke it on Trump’s behalf. Whitaker then said “your five minutes are up” to Nadler, as if he were in a position to enforce time limits on the Chairman, who is in charge of the entire proceedings. Even as Matt Whitaker was trying to dodge the question, he did end up definitively making the assertion that he hasn’t discussed the Mueller probe with Donald Trump. There is no way possible that’s true. Trump, by his nature, has no doubt asked Whitaker about the probe several times. If Whitaker refused to answer, Trump would have fired him on the spot. Yet Whitaker still has his job. So we know he just lied under oath. It’s not clear if Robert Mueller would be able to prove perjury on this particular answer, because it’s possible that there were no witnesses to these conversations between Matt Whitaker and Donald Trump. But if Whitaker committed perjury on that answer, he’s surely committed perjury twenty other times today, and Mueller is likely sitting on evidence to prove at least some of those instances. This means Robert Mueller can indict and arrest Matthew Whitaker any time he wants, and use the perjury charges to pressure Whitaker into cutting a plea deal against Donald Trump. Whitaker’s time as Acting Attorney General will likely be over within a few days. After that, he might want to start worrying about a pre-dawn knock at the door.